Todd Trice is a professional commercial photographer located in Bucks County, PA, north of Philadelphia and south of New York City. Serving the entire Philadelphia, NY, NJ area for Advertising, Event, Food, Product and Lifestyle photography. PA Turnpike to Exit #28 / Philadelphia. Pay toll and follow Route 1 North. Follow Route 1 North to the exit for I-95 North. Follow I-95 North to the first exit, which is Exit #49 / Newtown & Yardley. Follow I-95 North bound directions. Follow I-95 North to Exit #49 / Newtown & Yardley. At the top of the ramp, turn left at the traffic light onto Route 332 West. Follow Route 332 West until your 4th traffic light at which you will turn right onto Newtown-Yardley Road. Continue straight on Newtown-Yardley Road (the name changes to Washington Street in Newtown proper) to the 5th traffic light. At the 5th light turn right onto North Sycamore Street. Follow North Sycamore to the 1st light and turn left onto Durham Road. Follow Durham Road to the first light and turn right onto Eagle Road. Follow Eagle Road to the first stop sign at Wrights Road. Go straight through the stop sign at Wrights Road. The first driveway on the right, past Wrights Road, is the lane to the studio. Look for 4 Mailboxes, one is a stone monument, one is a barn, mine is white with 351 Studio on it. Turn right and follow the Gravel lane down past the second driveway on the left, following the signs for the studio and parking. The studio is located in the large red barn on the left. Turn left into the courtyard and park. The entrance to the studio is through the large oak door located at the right hand corner when facing the barn. Follow I-95 South to Exit 49 / Newtown & Yardley. At the top of the ramp, turn right at the traffic light onto Route 332 West. Follow Route 332 West until your 3rd traffic light at which you will turn right onto Newtown-Yardley Road. The first driveway on the right, past Wrights Road, is the lane to the studio. Turn right and follow the lane down past the second driveway on the left, following the signs for the studio and parking. 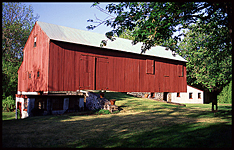 The studio is located in the large red barn on the left. Turn left into the courtyard and park. The entrance to the studio is through the large oak door located at the right hand corner when facing the barn.